You are here: Home / Groove Inc / Pullip Naomi: The Cute Diva is Ready to Perform! Pullip Naomi: The Cute Diva is Ready to Perform! This stunning rock and roll diva standing at approximately 12 inches tall is named Pullip Naomi. Her captivating dark eyes with a hip glitter eyeshadow are the features that you notice first. Her feeling: My Singing Voice tears up the light! Do you hear my Soul calling out the sound that unites fusion + light?...Feel Like so. 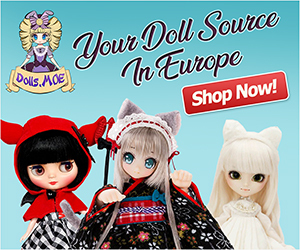 Visit eBay to order the exact same doll. Her eyes will move from side to side, up and down and she can even give you a coy wink from time to time. She has sleek, shiny black hair that falls to her knees, with a thick bang that partially covers her left eye. A delightful white feather is attached to a lock of her hair. She wears a simple black tube top with black hot pants. Her over skirt of gold satin, topped with white lace is sure to make Naomi a fashion hit. A white lace stole gives her outfit a touch of class. It’s the outfit accessories that really give her wardrobe that gothic rocker look. Her neck bears a studded choker. Attached to the choker is a chain that runs down the front of her outfit and wraps around her waist as a belt. A second delicate chain is also attached to the front of her choker and travels down to her waist; a silver cross dangles from the end of the chain. She wears tight black gloves on both hands that run all the way up both arms. Around each wrist is a stylish silver chain link bracelet. Under her black hot pants are some funky fishnet stockings with tiny tear holes which cover her legs. No rock divas outfit is complete without a pair of black chunk heeled ankle boots with black feathered tops. Naomi is fully articulated so she can be posed in a variety rocking positions. She comes with a variety of great accessories which include a silver microphone and doll stand. With her fierce rock and roll look she is a must for your fashion doll collection. A beautifull doll with dark hair brown with a nice dress. She’s one jewelry of my collection. I love his tails in the air and his make up is just perfect for her. Pullip Naomi is a rock star. I miss Pullip releases like this one, she was just so breathtaking!